Powwows are very festive occasions that bring to mind bright coloured outfits bedecked with beads and ribbons. All like to dress up including the little ones. So with this in mind the Baby Powwow dress was created. The dress features a gathered skirt with a printed band around the bottom, a yoke top and puffy sleeves with a cuff. Use beautiful Native patterned cotton with a small print for the skirt. Or try plain bright fabrics with a variety of ribbons or a fringe. Add a few beads to to neckline or on the yoke. 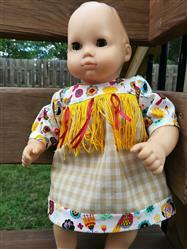 Use your imagination and no matter how you design this dress your doll will be a hit at the next Powwow. 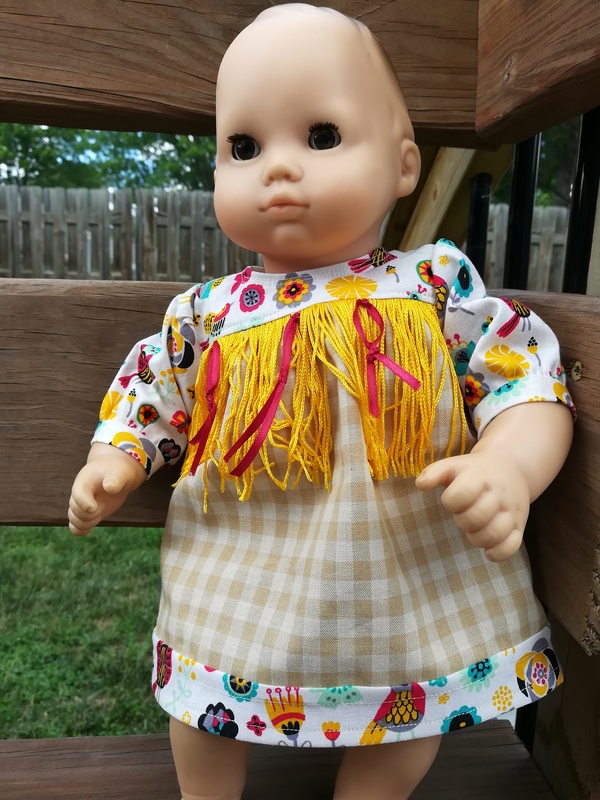 This pattern is designed to fit 15" dolls such as Bitty Baby®. Pixie Faire and the designers featured are not affiliated with Mattel® or any Native American Indian tribe. This pattern is a delight to work with. The instructions are clear and concise. The fit is very nice. The main part of the dress is Fat Quarter friendly. It meets all of my requirements for a five star rating.